At our first annual meeting in 2006, Robin Caudell portrayed Mrs. Maria Haynes, one of the last women to be manumitted in Plattsburgh. Laura Sells Doyle was presented a Lantern Light Award for her photographs of safe houses in our region. Her photographs are featured on our website. Marjorie Light was also presented an award for writing the script for our DVD, "Northward to Freedom" which can be ordered from us. Stories of the North Country Underground Railroad"
"Northward to Freedom" is an 11 minute DVD produced in 2005 by the Red Hummingbird Foundation and the North Country Underground Railroad Historical Association. It includes stories of the Underground Railroad along the Champlain Valley, Vermont and Québec corridor. 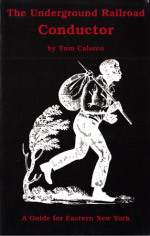 The DVD relates the critical role the Champlain Line of the Underground Railroad. Todd Moe of North Country Public Radio spoke with some of the folks who worked on the DVD project, including Don Papson, president of the history group. The Underground Railroad Conductor features stories of the Underground Railroad in northeastern New York. It was the first book to map out routes in the region. It contains a great deal of information that cannot be found in published form anywhere else. It is an especially useful tool for the student, and a chapter with tips on researching the Underground Railroad is included. In addition, there are road maps and directions to the legendary sites, which can be used to plan field trips. While it can stand alone as a rich source of information, it also serves as an introduction to Tom Calarco's larger hardcover, The Underground Railroad in the Adirondack Region, which can be ordered by calling 518-834-5180.